You can Special Summon this card (from your hand or Graveyard) by removing 6 Spell Counters from a "Magical Citadel of Endymion" you control. If Summoned this way: Target 1 Spell Card in your Graveyard; add that target to your hand. Once per turn: You can discard 1 Spell Card, then target 1 card on the field; destroy that target. This card is named after the Greek mythological figure of Endymion, who was beloved by the moon goddess Selene and put to sleep forever. This monster appears in the artwork of Spell Power Grasp. As told in the Gagaga Academy Tospedia card storylines, Endymion led an invasion on The Grand Spellbook Tower, seeking the unification of all knowledge of magic. However, his forces were abruptly stopped by the attack of Reaper of Prophecy, forcing him to withdraw. This monster has Spell Counters on the ring around his back, one in the center of his staff, and if you look closely; there are Spell Counters attached to his outfit. Following the pattern on the ring on the back of this monster (symbol, Spell Counter, symbol, etc. ), there are a total of 8 (4 are partly visible) Spell Counters. This monster's staff appears in the artwork of Chain Dispel. Removing six Spell Counters from "Magical Citadel of Endymion" is a Cost. This does not start a Chain. The effect which adds one Spell Card to your Hand targets the Spell Card in your Graveyard. Discarding one Spell Card from your Hand is a Cost to activate the effect which destroys one card on the field. This effect targets. If "Endymion, the Master Magician" Special Summons itself from the hand or Graveyard by removing six Spell Counters from "Magical Citadel of Endymion", then "Thunder King Rai-Oh"/"Black Horn of Heaven"/etc can negate the Special Summon of and destroy "Endymion, the Master Magician". : Can the Special Summon of "Endymion, the Master Magician" be negated by "Thunder King Rai-Oh" or "Solemn Judgment"? The effects of "Thunder King Rai-Oh", "Black Horn of Heaven", "Solemn Judgment", and similar cards can only be activated when a monster Special Summons itself without starting a Chain, such as when a Special Summon monster Special Summons itself. : Please explain what Special Summons can and cannot be negated by the effects of "Thunder King Rai-Oh", "Solemn Judgment", and so on. 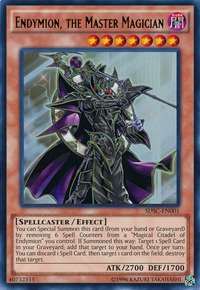 Example: The effect of "Thunder King Rai-Oh" can negate the Special Summon of "Cyber Dragon", "Dark Armed Dragon", and "Endymion, the Master Magician".